I seriously can't believe it's already 2012. It feels like this year has flown by, even faster than the years prior. I think we always feel this way... and I'll probably always wonder what happened with the time. The day, the week, the month. The year. It all flies by SO quickly. This year, Caydon turned 5. Kind of a big point. Half a decade. Where did the time go? I look back, and remember him being a newborn. Being alone with him in the hospital, wondering with fear if I was doing the right thing by signing my name on his birth certificate. Leaving the spot where I had wished I was writing my husband's name blank. Should I be on it? Should his bio-dad? God really guided me through that time, where I had no clue whether or not I should be keeping this baby, or giving him up for adoption. This memory, and fear, has been weighing on my mind quite a bit this past year. The time. The choices. Do I regret any of it? Absolutely not. But the lack of regretting doesn't make it any easier. It doesn't take away any lost time that I might view as "wasted". His first five years have been hard. Much, much harder than I ever had, or would, hope for my child. Learning about voids that another man, who should be his protector, has created. Suffering through countless doctors appointments, preschool teachers, hospital stays, seizures, pokes, pricks, IV's, and meltdowns. Something his neurological differences.. autism.. has brought him. I'm over this. I can sit here for hours... days... and write about how screwed up my son's childhood is. How I would change it in a heartbeat. Yet, I can't change it. I can't take back the past. I can't regain the wasted time, and the wondering of where the time went. I can, however, change my attitude about the future. I can accept our past "as is" and pray that our future is exactly what he deserves. I can make it a goal to be able to reflect next year at this time, knowing precisely where the year went. So that, when I'm changing the date on my classroom white board, I won't be wondering where the day, or the month, went. This is the kind of hope that so fantastic about having a relationship with God. He gives us the hope that we'll have a future. A purposeful future... fulfilling His will and preparing to enter His kingdom. How amazing, and divine, is this kind of hope. It's not one that I can create for Caydon, but I can absolutely share it with him. I can take the "wasted" 5 years, and tell him that his Heavenly Father hasn't abandoned him at birth. That this father hasn't had to be like me, working extra jobs to put food on the table, and hasn't "wasted" special times that could be given to making memories. That the little plastic blue preschool chair waiting by Caydon wasn't left empty because I couldn't get off of work for his school's Christmas party, and he had no one else to invite. (gah, guilt could kill!) While I can continue to try to be there for what Caydon needs, this father will always be there for everything, big and small. Both the special and the routine. This is a perfect hope for the new year, and the years to follow. We are so blessed, even amidst the struggles, the disability, the missed time, the shattered memories, the missing pieces of a family... We have hope, and that's all we really need in the long run. Kelsi you are such an inspiration for me. My little guy doesn't have autism but I am a single mom like you. Whenever I feel like I can't do it or I am overwhelmed I think if Kelsi can do it, I can do it ! Thank you ! Your pritty much amazing ! I love your categories of resolutions. Our family is also entrenched in the autism world. I am the aunt of a 13 year old boy. I enjoy reading your writings. Hang in there. You are not alone! Ps. 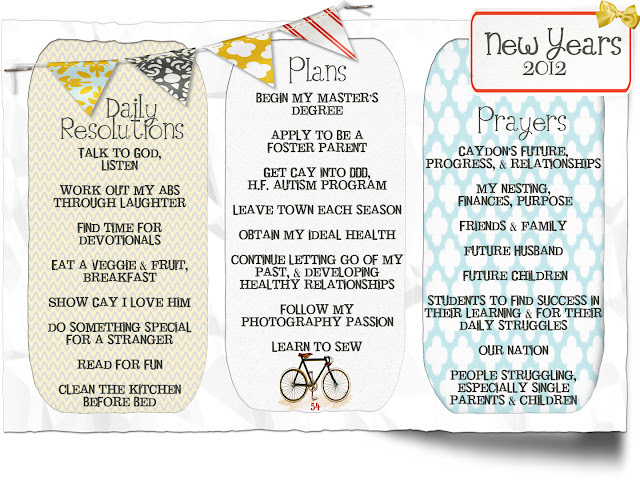 I would love to do new years resolutions in that format. Did you make that yourself van you tell me how I can get access to that beautiful template?